I had guests the other day and made this Mango and Black Bean Salad. Even though I am not fasting right now, I realized this would be a great recipe while on the Daniel Fast. The recipe was on a can of Bush’s Best Black Beans. Combine ingredients in a bowl. Toss and serve. All these foods you listed are allowed as long as they are free of sweeteners and additives. Be Blessed! Yes, smoothies as meal replacements are allowed on the fast. Also, can we make fruit smoothies in a blender although it is a sweet item to the lips? Can I have raisins, dates, apricots prunes, almond butter, and figs because they are fruits although they are “sweet to the lips”? Yes, brown rice noodles are fine (as long as all other ingredients comply). Tomato sauce is pretty easy to find without sugar, make sur you are reading the Ingredients list and not the Nutritonal list. I hope this helps! Hi, I was wondering if rice noodles are allowed because I am gluten free so I can’t do whole wheats…and what if tomato paste has sugar in the ingredients? Is there tomato paste that is just tomatoes? I’m still trying to figure all this out! This is my first time doing this. Thanks for any help! Yes, just watch what goes on top. Be Blessed! Can we pop baby white rice popcorn kernels on the fast? Yes, stone ground corn is fine. Just make sure to check the ingredients incase nothing else has been added. Be Blessed! Hello Susan, is Stone Ground Corn ok on the Daniels Fast? No, salt is allowed on the Daniel Fast. The scriptures don’t say anything about “tasty” but only indicate that sweet foods were not allowed. The only beverage on the Daniel Fast is water (see Daniel 1). So that leaves tea out of the fasting experience. Why is it ok to eat salt? I alweays heard no sugar and no salt as it was not mentioned that anything tasty touched Daniels lips but pulse during that time. I had the impression it was sacrificial eating of no salt too? Daniel may have boiled some of the herbs (pulse) dont you think? I just ask this because this woulod be tea…. These corn tortilla ingredients look fine, just make sure they are baked and not deep fried. Be Blessed! Hi Susan, Hopefully you still answer questions on this blog. I read that corn tortillas are ok. I picked some up from Whole Foods today and they are their brand. Only thing in them are Stone ground white corn, sunflower seed oil, sea salt, water, and a trace of lime. Is this acceptable? Very Godlike answer. I truly like this site. Sometimes when at work and fasting when i have people i know are christians to ask me to go to lunch with them or offer to buy me lunch ’cause they think its an out of money day i will tell them i am fasting simply because spiritual things are spiritually discerned and it sometimes encourages them to fast also that the Lord might bless and then they don’t ask me any more that week or during the time designted ’cause they know and understand and pray for me to make it through my fast. In Daniel 1, the prophet requested that he and his companions eat only pulse (food grown from seed) and drink only water. So, legumes and whole grains fit within those guidelines. Hi there, my husband and I will start the Daniel fast and we need something settled before we do. Can you have soup bean, navy, pinto and black beans on the Daniel fast? I looked them up and they are considered a fruit, however, my husband and I are disagreeing on this matter. Beans or no beans? He wants them included…..he’s a real meat eater. Thanks! my husband and i have done the daniel fast and lost quite a bit of weight when doing so. we would like to do it again, however we to just had a baby 3 months ago and i remember when we did the fast this detoxed our bodies. will this be harmful for my baby while breastfeeding if it detoxes me again? First, congratulations on the new precious life God has entrusted in your care! What a wonderful blessing! The Daniel Fast is very safe for pregnant and nursing mothers. However, I always encourage women to check with their health professional before engaging in any dietary change. The Daniel Fast is a healthy way of eating. Since you are nursing, you might want to increase your leafy green vegetables (think of cows and all the milk they produce) and you might also want to add chicken and/or fish to your meals. Finally, salt IS allowed on the Daniel Fast as are all spices and herbs. The important thing is to read the label since some manufacturers add sugar and chemicals to the prepared seasonings. I copied the recipe “Mango and Black Bean Salad” from above and it called for Salt to taste. Can you eat salt on the Daniel Fast? My daughter (16 yrs old) and I will be staring the fast very soon. However, I am researching all information because I am currently nursing my 5 month old. Is this safe to do while nursing? How can I gain weight while trying to manage my blood sugar levels? Regarding weight loss, there are many factors that determine when your body starts sloughing off the pounds. But if you have an average body, you should start to see weight loss in about 3 or 4 days. With that said, I have known people to actually gain weight on the Daniel Fast by eating too many nuts and high-calorie, high-fat foods. I always lose weight on the Daniel Fast. I have an average body and weight. I drink lots of water on the fast, eat moderately and try to keep a balance in the types of food that I eat. 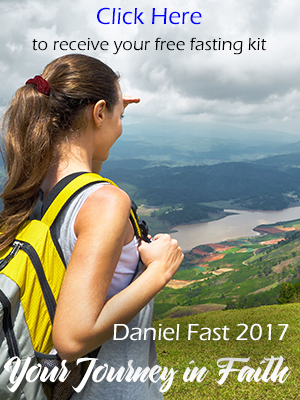 I receive reports from some people who have lost more than 25 pounds on the Daniel Fast! They are usually those who normally eat a lot of fast food and high calorie diets. Yes, you can have corn tortillas as long as they are chemical-free, sugar-free, and free of any animal products. So make sure you READ THE LABEL to find out of they are okay. I have not bee real successful in finding tortillas that are not packed with chemicals. So I make my own. The recipe is on this site. I use flour, but you can substitute finely ground corn. Yes, go to the baby shower. However, you might want to eat before you go. If the food there is not consistent with the Daniel Fast, just don’t eat. Drink water only . . . and if asked, simply say you are on a temporary special diet. To remain true to the scripture and keeping a humble heart, don’t bring any attention to yourself about this. Just a simple, quiet explanation is in order. Forgoing the baby shower because of food would not be in order . . . I know you can act in an appropriate manner. I have had to meet these situations many times and I find a simple and quiet explanation meets the need. are corn tortillas ok on the Daniel Fast? I know all sweets are out. Yes, potatoes are fine. In fact, yams and sweet potatoes are also great baked as you described. You can even drizzle some olive oil on them. You can also fry then in a small amount of oil. We can’t deep fry foods when on the Daniel Fast, but using a small amount of oil is perfectly within the guidelines. Be blessed on our fast! By the way, this recipe was a big hit with my guests. They were amazed at the great flavors! If you like full flavors and mangos, then this is a great recipe for any time, including when you are fasting or not!